⑴ One of the hardest things to do in life, is letting go of what you thought was real. ⑵ That hardest things to do is watch the one you love, love someone else. ⑶ I trusted you but now your words mean nothing to me, because your actions spoke the truth. ⑷ I am proud of my heart. it’s been played, stabbed ,cheated, and broken but somehow still works. ⑸ Pain makes you stronger, tears make you braver, and heartbreaks make you wiser, so thank the past for a better future. ⑹ A break up is like a broken mirror. it’s better to leave it than hurt yourself trying to pick up the pieces. ⑺ I just want somebody who will never stop choosing me. ⑻ I’m going to smile like nothing is wrong, pretend like everything is all right, act like it is all perfect, even though inside it really hurts. 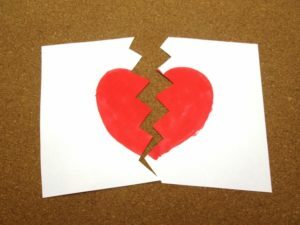 ⑼ If it doesn’t break your heart, it isn’t love. ⑽ You lost her. And now she lights up that night time sky for her new lover, cause he recognized her as the moon. And you envy him. She could have been your moon, but you were too busy chasing that dimly lit stars.